I’m adding this new feature to my blog, so that when I come across a quote that has made me smile or made me think, I will be able to share it. Most of the time, my quotes will be Canadian, in keeping with the main theme of my blog. My first quote comes from a book I just read and reviewed, called The Rise and Fall of Great Powers by Tom Rachman. I loved this book, and, this is one of my favourite quotes from it. People kept their books, she thought, not because they were likely to read them again but because these objects contained the past – the texture of being oneself at a particular place, at a particular time, each volume a piece of one’s intellect, whether the work itself had been loved or despised or had induced a snooze on page forty. Why do you hold on to books? I actually only keep books I think I’m going to read again. I still have hundreds of books, so obviously I am more optimistic than otherwise. However, I do many of them more than once. You read so many books, I can’t imagine what your house would look like if you kept them all! That sounds like a pretty good way to decide which ones to keep. I probably couldn’t walk in it if I kept them all! Actually, I have kept them all for several years, in boxes, with the idea of eventually listing them for sale. But I still have hundreds on my shelves! Maybe thousands. Well, they’re all over the house, but most of them are in the living room. But they will not fit in one picture! Oooh, I’d be interested in taking some of them off your hands if it weren’t for my own piles of books that are lying around the house. We all have the same problem! This is EXACTLY why I am having such a hard time getting rid of books, even if I don’t like them. Me too! That’s why this quote really struck me. First of all – I LOVE the idea of this feature! I agree; some books I will never get rid of because of the sentiment that it holds, whether it be a time in my life or the content of the book itself. Great quote 🙂 I’m working on my review of this book still – hoping to get it posted today! Thanks for the encouragement! I’m always nervous to post something new. Looking forward to reading your review! I think this is a fantastic new feature, Naomi, and I love how you use the quotes to start conversations! I carry around a little notebook as well to write down quotes that really strike me. I just have a hard time parting with books that I’ve either really enjoyed or respect. I do get rid of books that hold no meaning for me. 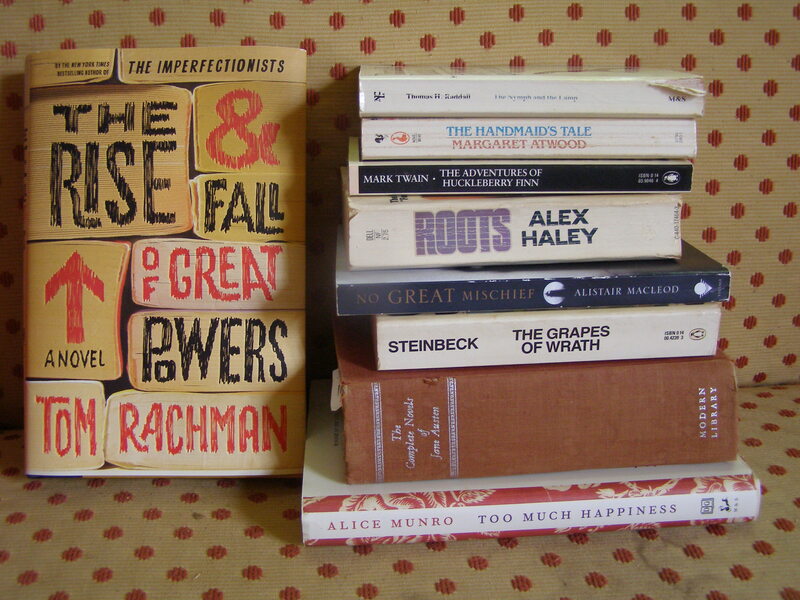 To me getting rid of good books is almost like getting rid of photographs. Books accompany me throughout life and each one has made a mark on me in some way, shape or form. I used to hoard books, but i don’t keep nearly as many as I used to. A trans-Atlantic move teaches you to cull your collection. Now I love giving my books to people. If you come over to my house you are guaranteed to leave with at least one book. By the way, i love this feature! Thanks, Tanya! And I love that you give your books away. That would be hard to do, but I can also see how it would be fun! Are you ever afraid they won’t love it as well?